*High Priority insured FedEx Shipping costs included, US and Canadian tax rates excluded. **Insured shipping costs excluded, Dutch BTW included. ***Uninsured shipping costs included, US and Canadian tax rates excluded. Anishinaabe Mashkiki Waawiyeyaatig, the Ojibwe Medicine Circle ("Wheel"), is a sacred symbol. Originally represented by grandfather-stones or pebbles laid down on the earth in a circular form, a medicine circle is basically a cross within a circle. This cross symbolizes the concept of quadrinity of all life that lies at the base of Creation, or the Cosmos. The circle of the wheel is WAAWIYEKAAMIG, the Universe itself. The Medicine Cicrle, or rather the schematic, graphic representation that we often see today containing four differently colored quadrants (called "circles"), is not a symbol that is native to the Anishinaabe peoples, but the idea behind it certainly is. In the old days the concept of the "Medicine Wheel" was referred to as wayaawiyeyaag bimaadiziwinining (The Circle Of Life), symbolizing the natural cycles of birth, growth, death, and regeneration. This is the meaning of quadrinity as the ancestors perceived and understood it: everything in life comes in fours and every living being exists of four parts. The four human races, the animals (two-legged ones and four-legged ones), the winged ones, the swimmers (fishes), the creatures on the ground (plants, rocks, the insects, and worms), the spirits, and the celestial bodies are all represented by the oxidized symbols and the stone that I depicted and placed in the big circle. 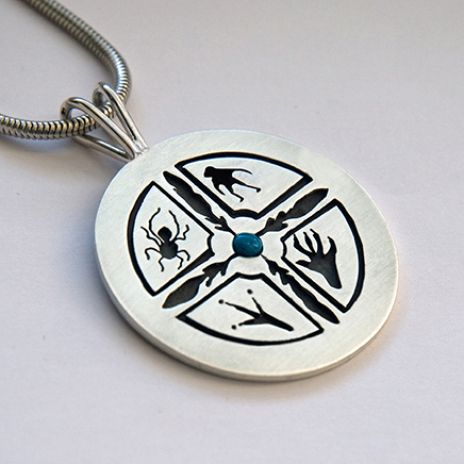 Each symbol tells a part of the big story, as does the turquoise stone in the center. The circle of the wheel stands for all cycles that exist in nature: day and night, ebb and flood, the seasons, the moons (months), the cycles of human life, and the orbits of the moon and the planets. In a metaphorical sense, this silver Medicine Circle is a physical instrument, a life-guiding compass, and a mirror of nature reflecting all aspects of human life. The Four Cardinal points on the Medicine Circle are the Four Sacred Directions, usually represented among the Ojibwe Anishinaabeg by the colors yellow, red, black and white. Blue represents Father Sky in the upper realm, green represents Mother Earth below, and purple represents injichaag, the core of self, our spirit/soul that journeys in this physical world, at the center of the wheel. 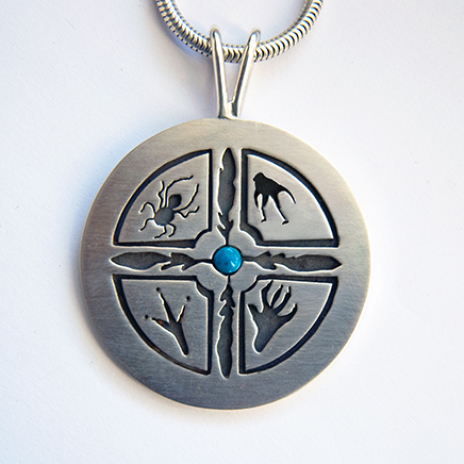 However, since this silver Medicine Circle pendant contains personalized symbols, I took the liberty of placing a turquoise stone in the center with four eagle feathers attached that point to the four corners of the Earth; the feathers in themselves representing injichaag, or spirit, and the blue stone symbolizing Giizhig, the Sky Father. A Medicine Circle, or the four circles of the Medicine Circle, are always viewed in a clockwise direction, starting in waaban (the east), rotating to zhaawan (the south) and bangishimog (the west), and arriving at giiwedin, the north circle on top. Visit my Art Blog to read more about the Medicine Circle.